IPHONEOGENIC features interviews with iPhoneographers from around the world and is one of the leading voices in the iPhoneography world. Thanks goes out to the Editor and curator Edi Caves for permission to use this interview. Click IPHONEOGENIC to visit my favorite blog. 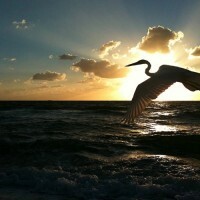 Andy Royston, known to many as FtLauderdaleSun has an amazing eye for capturing his hometown. His images are mostly unprocessed and shows raw detail of what his iPhone sees. FLS’ work always seems to have such an inspiring and heart-warm aspect to it, which truly captures the majestic feel of the moment. EC: Where are you from? Tell me about yourself? AR: I grew up in the coalfields of South Yorkshire, England, which is where I got my love of the open air. I’ve been a professional art director, designer and brander for over thirty years and have worked in the magazine, music, television, advertising and internet worlds. Picked up a BDA Gold and an RTS award during my time working in TV News. I’m now Creative Chief at a busy design company after joining the company from London. I work long hours and have a ridiculous work pace! After I leave the peace of the beach I’m pretty much flat out. I’m very lucky – I have a lovely wife, terrific family, and a million deadlines to meet! AR: Like many people I guess I just used the iPhone as portable family album, snapping cute family snaps now and again. I didn’t consider the iPhone fulfilling any kind of photographic purpose for quite a while. I had my nifty digital cameras, and my work DSLRs and they did the job very well. I’ve owned an iPhone from day one, and could always get the best out of it but nothing I’d consider showing any strangers. AR: I remember it very clearly. 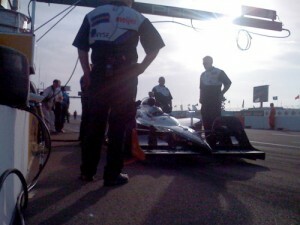 It was on a Saturday morning on a work assignment over at the St Pete Grand Prix. The media briefing at race events are always at at some insane early hour and that day we emerged to an especially gorgeous sunrise on the bay by the race track. 1st practice was pretty early and I get to the pit wall just in time to see our client Marco Andretti jump into his race car and get down to business. The light was low along the main straight and made for a terrific scene. I wanted his fans to share it, so iPhoneography was born right there. My work at race tracks made me understand the value of sharing a special event, as you’re able to represent that event to people who cannot be there. iPhone lets you do that – you can capture and share almost instantly. I wanted to be able to provide quality event photography to an audience who really cared and appreciated the insight, and this meant being able to take great and powerful images and video on the spot, whatever the weather. In short I needed practice. So I began the http://www.twitter.com/ftlauderdalesun project primarily as a way to hone my technique . Then something unexpected happened – @FtLauderdaleSun found a loyal audience, and it’s because of the consistently positive responses that I’ve kept uploading every day. Few of my sun rise images are recognizably Fort Lauderdale. Indeed you could take similar photos from anywhere in the world. My subject – the trees, the sky, the sun and the beach – are universal. AR: The iPhone is just one of an ever growing range of cellphones capable of great mobile photography. We shouldn’t build a community that excludes. I love the iPhone but the iPhoneography term limits our vision and understanding. What is clear though is the iPhone’s interface – the touch-to-focus tilt-to-expose offers a fast track to the future of photography. In a very short time out cellphones will be outputting incredibly detailed photos and video and we might as well hone our skills so we are ready! AR:Being a competent photographer is an essential in my field of work. In the design world photography is just part of your arsenal. But how that relates to my Fort Lauderdale Sun project I’m not sure – that’s a private, personal project a world away from all that professional shoes-on stuff. EC: What about your hometown is so special that it makes you what to capture it through your iPhone? 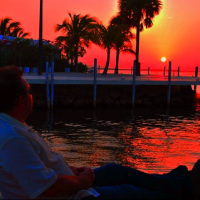 AR: Well I love Fort Lauderdale for many reasons, but my photographs are of something quite special – The morning sky. My morning beach walk, started primarily because I needed to get more exercise – is just the way I start my day, and this has meant that the experience is something I love very much. It is my wilderness and it never ever fails to be a spectacular experience. How can I not share it. EC: Who or what are your artistic influences? Oh you meant visual artists? Turner, Courbet, Manet, Gaugin, Modigliani, Klimt, Schiele, Kokoschka, Die Brücke, Rothko, Warhol… I love the ‘Floating world of Japanese Ukiyo-e prints, where artists like Hiroshige, Utamaro and Hokuskai showed us how to use natural framing. Working in TV news teaches you that great work can last for just the moment: is seen and is gone. I have no preciousness about my work and don’t really care about yesterday’s photos. It’s all about right now. I’m very throw away with my art. AR: Probably that I can’t adequately capture the intimacy of the natural wildlife. It’s the ospreys, pelicans, gulls, and waders that remain out of reach, photographically. An osprey over the ocean is a breathtaking sight. I’d love to share that. AR: Professionally I’ve been published a lot. Fort Lauderdale CVB (@visitlauderdale on Twitter) have been terrific supporters and use my work often. I’ve been a best-in-show at Wired Magazine and in EYE’EM’s Light competition but that’s about it so far for Ft Lauderdale Sun. I have a policy of not entering competitions – If galleries would like to show my work I’d rather they approached me than the other way around. My experience of the iPhoneography community is in the continued support and encouragement from individuals, especially Dan Berman, Sion Fullana, Dixon Hamby, Robert-Paul Jansen, Jordi Pou and Jon Betts, all of who’s work I’m a great fan of. I owe them a great debt for seeking to include me in their iPhoneography gang. AR: I have found my photos move people, and I regularly hear from people who find my work inspirational and uplifting. I too feel the emotional power of a new sunrise and am very grateful that I can touch peoples hearts with a photograph. I think people know that my images are real, and represent the very same dawn they see too. It makes the images more powerful, I think. Not everyone can walk such a beautiful day everyday, and if my images help uplift, motivate, or inspire others, then that’s a wonderful thing. EC: What’s in your iPhone camera bag? What app(s) do you currently use the most often? AR: PS mobile is a wonder, and is the first app I turn to when I need to lift the darkest images. Others that help are Perfectly Clear and Iris – both of which work quickly and help me with my black and whites, a new area I’m still working on. I use TrueHDR to create pull-focus effects, many of my seashell images are taken with that. I also love Hipstamatic’s challenge (I always try to get at least one great Hipsta on my walk). EC: Since you don’t do much post processing to to your work, Would you care to share some insight about capturing during your famous FLS walks? I’m frequently taking photos in bright sunshine and high humidity so my aim is to take a photo that uses the perspective, the available light and color to get a perfect shot that needs little work at all. I sometimes sit on the sand and do app work but it’s not practical for me to walk along sand and do app work at the same time. Here is a progression of how I’m always looking for angles. This set comes from mid August, when temperatures are in the high eighties. Picture 1) As you can see apart from two lazy pelicans there’s not a lot to work with. 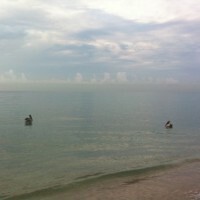 The ocean is very calm and the sky is very gray and hazy. But it’s dawn, so the diffused light through the clouds I know will add contrasts. 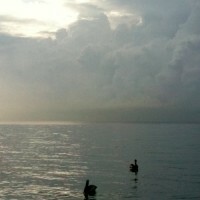 Picture 2) captures a gloomy contrast, and it’s nice to get close to the pelicans but its still not a interesting scene. Picture 3) A change of position and a slow wade into the ocean and things are coming together. The light is beautifully diffused and the shape of the birds is much more defined. 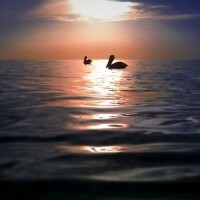 As you know I live for silhouettes and pelicans are a great subject. Here I’m looking for sky and for contrasts on the water, trying all the time to move slowly and not distract the birds, who rarely stay on the water surface for long. They must have had a good catch this morning and look mighty pleased with themselves. Picture 5) and I’m almost waist deep in ocean and the iPhone is held upside down to get the lens as close to the water surface as possible. I’m angling the phone to get just the right amount of light into the lens, at the same time ever mindful of getting the horizon straight and making sure there’s no rogue wave heading in to drown the camera. 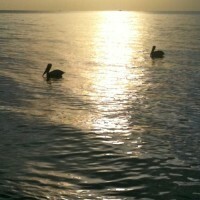 And the pelicans didn’t seem to mind. Picture 6) If I was to post produce, I’d probably end up with this – a PSMobile crop, a 3 Strip Technicolor filter from Iris, and TiltShiftGen to create mood. Does it enhance the shot? Maybe. But perfection for me is to use my favorite app of all, the available light. AR: Just that the best is yet to come. I like to work quickly and decisively and I see future Phonecams working to help me do this with sharper images and faster uploads. I still think I haven’t got to the bottom of possibilities and sharing art and experiences in real time. I’d like to thank you for this opportunity to explain my work and hopefully people will have a little more understanding of why I choose to take these crazy beach pictures every day. 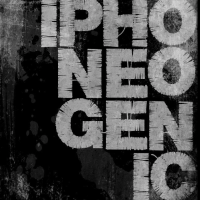 Thank you Andy for participating in this feature here on iPhoneogenic, the iPhoneogenic Facebook Page, and on Twitter. I’m honored to have you on my blog.